In many politically unstable areas, workers are forced to work in mines to source minerals, such as tin, tungsten, tantalum and gold. These conflict minerals can be used in all kind of products, such as the electronic devices we use every day. 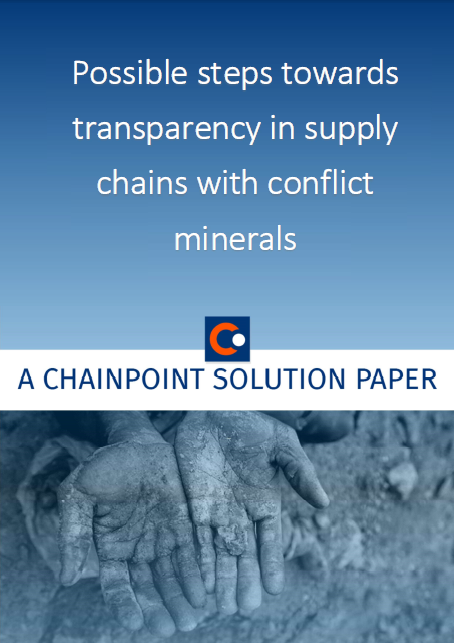 To stop the use of these conflict minerals transparency and traceability in the supply chain is needed. This is where iTSCi comes in. The iTSCi Programme uses ChainPoint software to track and trace tin from mines, processors and exporters in the Democratic Republic of the Congo, Rwanda, Burundi and Uganda. In every step of the supply chain bags of tin can be tagged with a specific code that is unique. When that bag goes to the next stage of the supply chain, it is recorded again until finally it is exported linked to a unique export number. With a very detailed logging system, users at the end of the supply chain can see for each bag of tin where it was mined, processed, traded and smelted. This data can be presented in multiple ways, like maps, charts and graphs.